bathroom, festival, Holiday, shows, restaurant, hotel, yard, garden, patios, commercial building, shopping center etc. 8 Kinds of different light modes available, in waves, sequential, Slo-Glo, chasing/flash, slow fade, twinkle/flash, and steady on. Once certain mode is selected, it will stay on that mode everyday until you press the MODE button to select another. Built-in Lighting sensor technology, the string lights will light up automatically at dusk and automatically turns off at dawn ( Make sure they get enough sunlight). Protect the solar lights for indoor and outdoor use perfectly. 1. First, connect the solar panel to the stake. 2. Second, make the stake stable on the ground and ensure that the solar panel is not sheltered from the Sun, or it can't be charged. 3. Third, put the lights on the tree, door, window, etc. 4. Finally, remove the protective film of the solar panel, and press the on/off button, then the string light will start working. The MODE switch allows you to change the light mode. -Waterproof design is limited to rain and moisture. Do not immerse the product in water for a long time. - Please notice that the stake bottom is extremely sharp. Do not allow children to use the product. 【36ft 60LEDs Crystal Ball Fairy Lights】: A 432 inches Bubble Crystal Ball Lights is with 60 LEDs fairy bubble crystal ball, the diameter of each globe is 1.0 inch and spaced every6 inches. 【Solar Globe String Lights 】: Up to 8 hours of continuous lighting with solar panel fully charged, it even charges on cloudy winter days. These lights are turned on automatically in darkness and turned off automatically in brightness. 【IP65 Waterproof and High Bright】: The outdoor solar globe lights can withstand all kinds of weather,including heavy rain and snow. Offer bright light and provide a warm environment for you, totally meet your various demands. 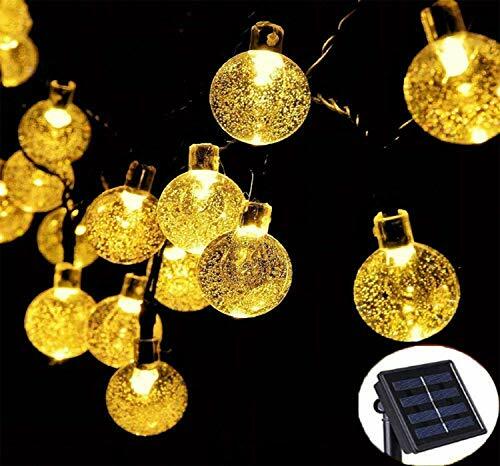 【Easy to Use】: The solar globe string lights is very easy to be installed. Just sure it can get sunlight. The ON/OFF and mode adjusting switches are on the back of the solar panel. 8 Modes :Combination, In Waves, Sequential, Slo-Glo, Chasing/Flash, Slow Fade, Twinkle/Flash, Steady on. 【Wide Application】: The Bubble Crystal Ball String Lights capable to be folded in any shape to perfectly decorate any places as you want. Such as:Bedrooms, ceilings, streets, kitchens, patio, backyards, walkways, lawns, fences, roads, courtyards, Windows, shops, halls, stage, bars, etc. If you have any questions about this product by Nasharia, contact us by completing and submitting the form below. If you are looking for a specif part number, please include it with your message.